Heat oven to 350°F. Spray 13x9-inch pan with cooking spray. Let frozen rolls stand at room temperature 10 minutes. Cut each roll into 12 pieces; place in large bowl. In another large bowl, slightly beat eggs. Reserve 1 tablespoon of the syrup in small microwavable bowl; add remaining syrup to eggs. 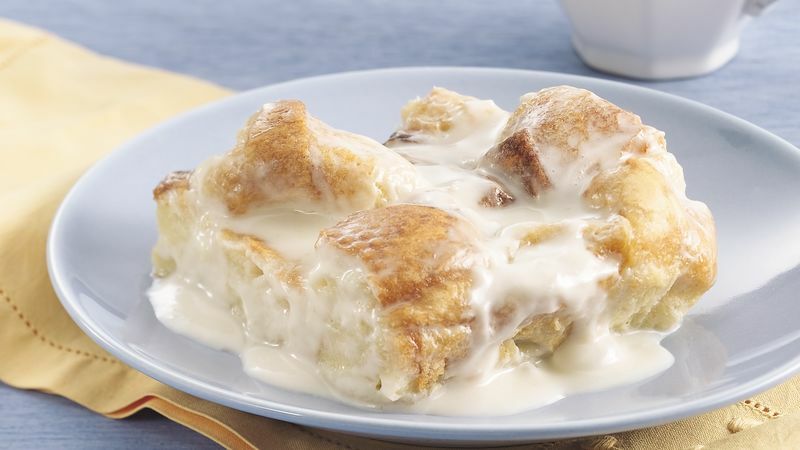 Stir in sugar, baking powder, half-and-half, milk and melted butter until well blended. Pour mixture over roll pieces in bowl; stir to coat well. Pour mixture into pan, pressing bread into liquid with back of spoon. Let stand 5 minutes; press down bread again. Bake 45 to 55 minutes or until top is golden brown and knife inserted in center comes out clean. Cool 20 minutes before serving. To reserved tablespoon syrup, stir in frosting and yogurt. Microwave on High about 20 seconds or until melted. Stir; pour over warm bread pudding and spread to cover. Cut into 12 servings. Serve warm with ice cream; garnish with mint and sprinkle with powdered sugar.